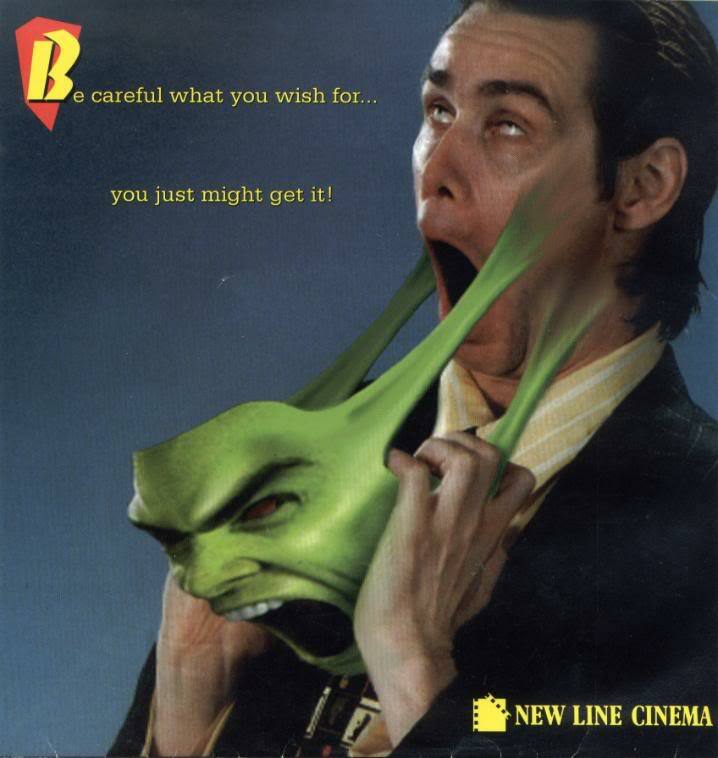 Pop Rewind — Jim Carrey’s The Mask: A Proud Part of Ontario’s School Curriculum? The year was 1995. 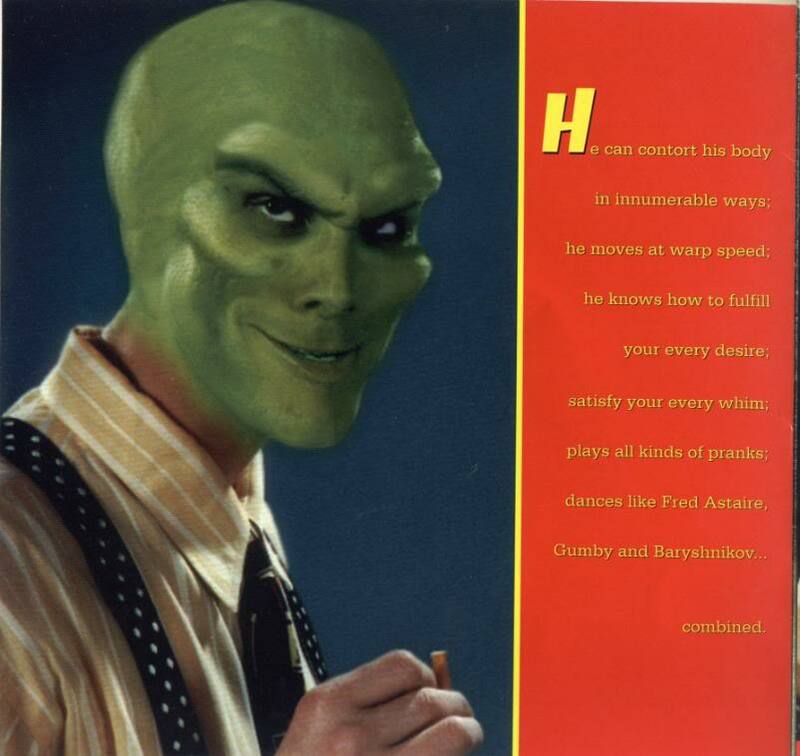 The world was still enjoying the SSSSSSMOKIN’ Jim Carrey as Stanley Ipkiss in the previous year’s film The Mask. My seventh grade class? We were reading the novelization of The Mask. Especially interesting considering the movie was rated PG-13 and we were 12. There’s something to be said for movie trailers from the 90s. It’s not quite “Rob Schneider is… A STAPLER” territory, but we can clearly see the progression toward that. The novelization was written by Steve Perry, who also wrote novels for Star Wars and a few other franchises. I’m a little sad my teacher didn’t opt for one of his Alien vs. Predator works as a follow-up to The Mask. My seventh grade teacher based lessons around the book. After every chapter, she’d have us do vocabulary activities where she’d give us 10 or so words from the chapter to look up in the dictionary. It’s where I learned the word “paisley”. I used lime green and a dark green gel pen to do my Mask-related school work and thought I was so cool and clever for my color co-ordination. The Mask novelization as curriculum was a weird choice for several reasons. My teacher was very prim and proper (we had to say “Yes, Ms.” when addressing her and “excuse me” any time we passed by her), so a fun, light-hearted book wasn’t something any of us were expecting. The only other book I remember reading in grade 7 was The Hound of the Baskervilles. And I remember the whole class being like, “The eff is this?! Why is it so long and boring? !” You can’t give an 11 year-old a novelization to a popular film and then follow it up with Conan Arthur Doyle. Come on. My copy of the novel is long gone, but luckily, Bringing Paperback has a couple great excerpts and also links to an interview where Perry states “I did a novelization of a movie called The Mask as a favor for my editor at Bantam”, explaining so much. According to those excerpts from Bringing Paperback, there’s a couple lines in the books that reference orgasms. Understand that I went to a Catholic school. There’s no talk of orgasms (or orgasms at all) there. How did this happen. Sometimes I’m glad it’s not the 90s anymore so we don’t need to edit photos in Kid Paint. Want more? Not sure why you would, but have at it! On the plus side, at least I never had to read a novelization for Son of the Mask.